I love the Kay Hunter series by Rachel Amphlett so I was really excited to get this ARC in my inbox. Thank you Rachel! Call to Arms kept me on the edge of my seat it was a real page turner. It was full of twists and very cleverly written, I had no idea who the bad guy was right until the very end, there is no way I would have guessed it. The outcome was quite shocking actually! I was like wow didn’t see that one coming. Page after page it kept delivering keeping me hanging on to every word. Kay is such a great detective and has a really good team around her, together they are like a bunch a Rottweilers hanging on to the heels of a robber, not letting go until they figure the case out and bring it to resolution. I like how Kays partner Adam brings out her softer side, it’s a really nice contrast to the ballsy detective who never stops and always has her mind on the job even when she is physically and mentally exhausted. It shows her as being human and vulnerable which is really nice to see. I’m not going to go in to the story line of this book, you can read the authors blurb below from her website to get a precis on the book. I prefer to give my opinion on the book not give out any spoilers, I hate spoilers, I like to read a book and have that WOW moment. You can of course read this book as a stand-alone novel but I would recommend that you read the series, not just because it’s a great series but it will give you some background and insight into Kay and her team. I highly recommend this book it was great I really enjoyed it, I actually read it in super quick time because I couldn’t and didn’t want to put it down. I am giving Call to Arms 5 stars, it really deserves it. The book is due to be released on the 11th March and you can read more about the Kay Hunter series and Rachel Amphlett on her website at the link below. 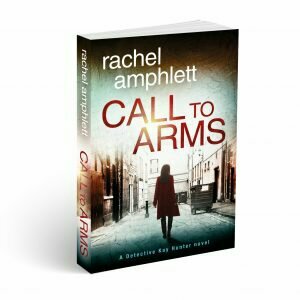 This entry was posted in Book Review and tagged Bonnies Book Talk, Book Review, Call to Arms, Crime Fiction, Crime Thriller, Detective, Ebook, Great Read, Kindle, Mystery, Rachel Amphlett, Thriller Book. Bookmark the permalink.